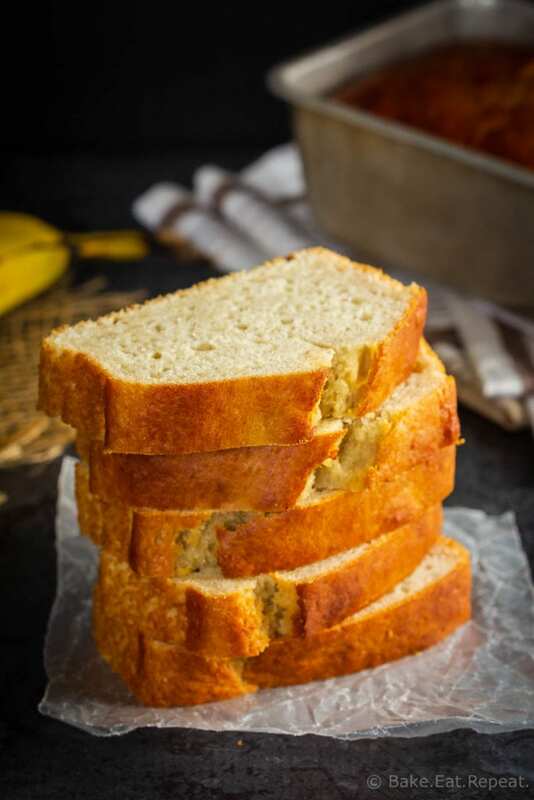 This classic banana bread is easy to make and everyone will love it – the best way to use up some over-ripe bananas, and it makes a great breakfast or snack! Do you have a favourite, go-to banana bread recipe that you think of every time you have those over ripe bananas just begging to be used? I have plenty of recipes I love to make with those bananas. It’s usually a bit of a debate trying to decide what to make with them. There are just too many choices. Banana muffins, banana cookies, banana cake, banana pancakes, or banana bars – so many options! But after finding this classic banana bread recipe in a very old cookbook of my mom’s (and then messing with it a bit because I can’t leave well enough alone! ), I have to say that this bread might be the winner now. Even when I already have a loaf waiting in the freezer. How do you make a moist banana bread? To get a moist banana bread, use very ripe bananas. They should be quite dark in colour. If they’re only just starting to get brown spots on the peels they won’t be as sweet. Bananas that are very ripe with lots of brown spots on the peel are best. 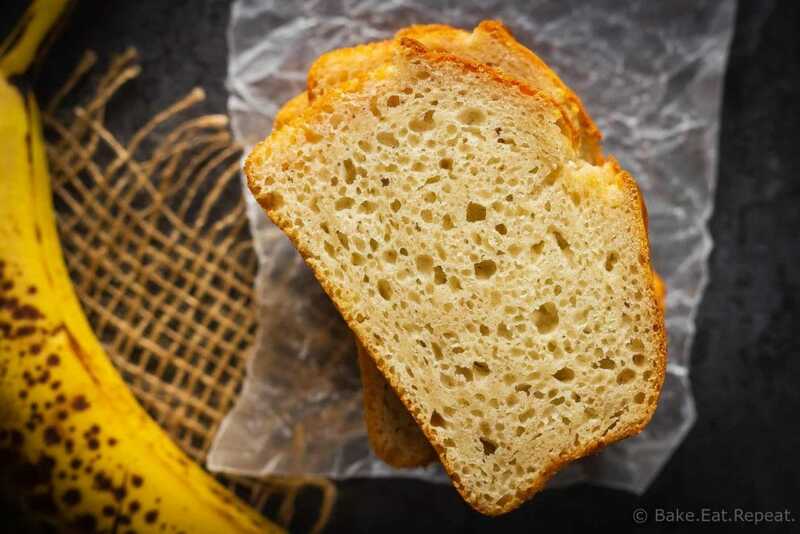 Using frozen, thawed, ripe bananas also adds more moisture to the bread. You also need to be sure to only stir until the ingredients are just combined. If you stir the batter too much your banana bread will have a denser texture. In my opinion, this is the best banana bread recipe I’ve ever tried! It’s easy to make, only has 8 ingredients, and makes two loaves of bread. This bread freezes well too. I love that this banana bread thaws beautifully and tastes freshly baked. 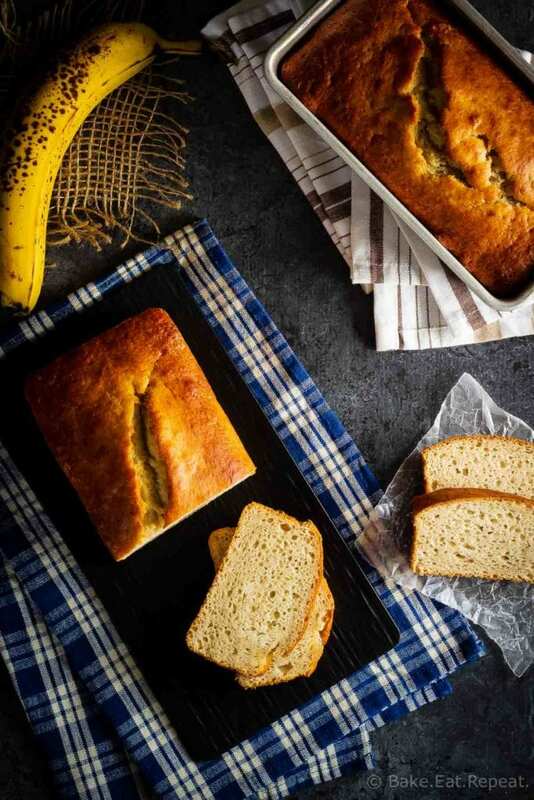 Is homemade banana bread good for you? I like this homemade banana bread recipe because it is healthier then a lot of the recipes I’ve tried. It’s not overly sweet which is nice. Most of the sweetness comes from the bananas rather then excessive amounts of sugar. I like that there is only three quarters of a cup of sugar for two loaves. It also has less oil then most banana bread, with only 1/3 cup of oil for two loaves. You could also substitute half whole wheat flour to make it even healthier. You can substitute 1 cup of milk mixed with 1 tablespoon of vinegar or lemon juice for the buttermilk. Sometimes I’ll substitute 1/2 cup milk mixed with 1/2 cup of sour cream which also works well. I like to blend the wet ingredients (eggs, buttermilk, oil and bananas) with an immersion blender as it’s quicker then mashing the bananas, but you can definitely just mix it all together by hand instead. This recipe is made in two 8×4 inch loaf pans– don’t try to make it in larger 9×5 inch pans as they’re already fairly short loaves and won’t work very well in two 9×5 inch pans. If a 9×5 inch pan is all you have I would recommend filling it about 2/3 full to make one loaf and then baking the rest of the batter as muffins (about 20 minutes bake time, same temperature). 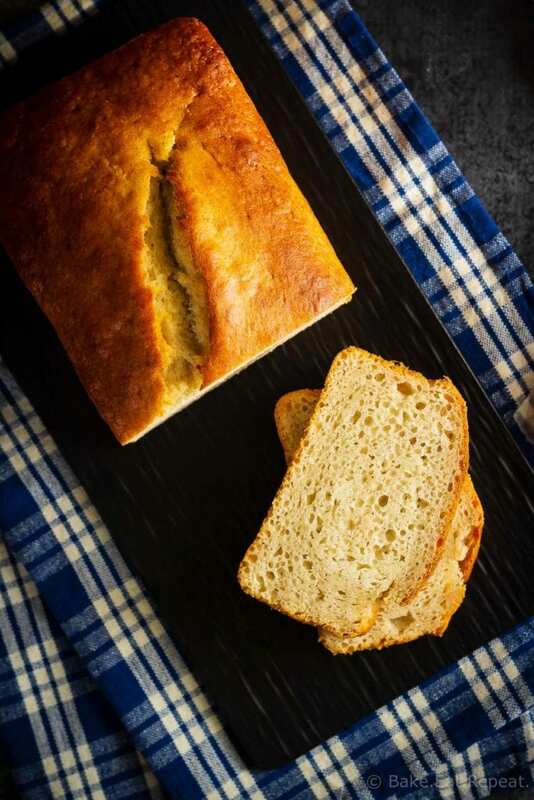 Here are some more amazing quick bread recipes for you: Glazed Raspberry Lemon Bread, Marbled Chocolate Orange Bread, and Cream Cheese Filled Carrot Bread. I’ve also shared this Banana Bread recipe over on Food Fanatic.